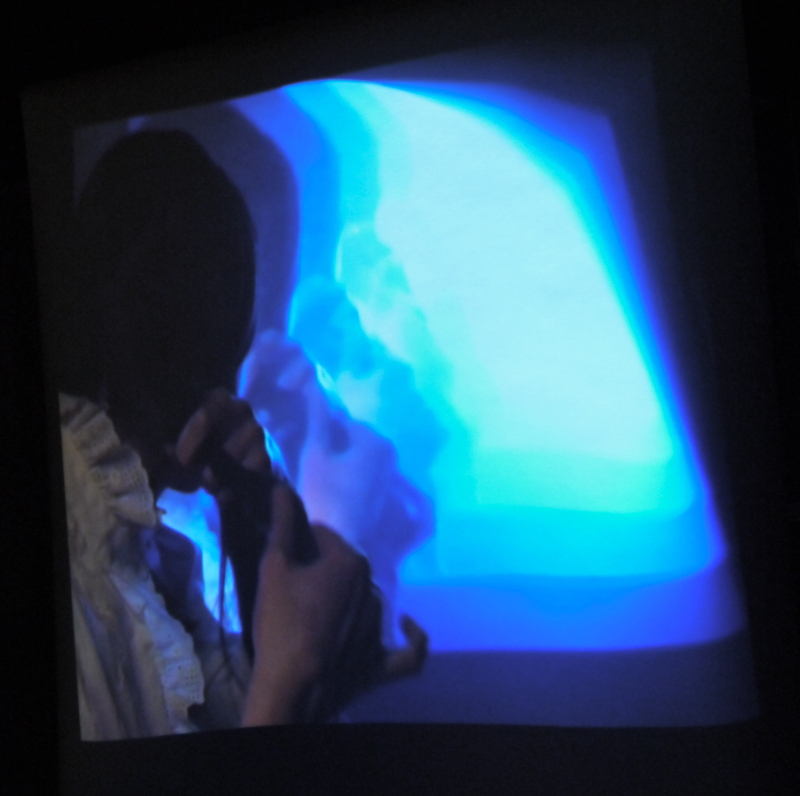 The development of Portrait has involved two research processes that I make use of in my dance and film-making practice; researching through practice an ordinary physical task – in this case the task of dressing (the live action); and the process of deciding how to frame the movement material (visible in the projected image). In carrying out a live pedestrian task in ‘real time’ in a similar way to the movement/sound tasks of Figure (s), I aimed to draw attention to the passing of time through its duplication in a second space/image. By framing some of the activity in close-up, I also strove, by bringing the viewer closer to the action and giving them more detailed information about it (as in Walter Benjamin’s “deepening of apperception” in The Work of Art in the Age of Mechanical Reproduction), to accentuate the viewer’s experience of the physical nature of each task. With hindsight, I can also see that I am naturally drawn to an approach that historian Erin Brannigan has identified as a particular characteristic of the dance film genre, namely, the “transference of movement across people and things” (see her chapter on the close‑up in the book Dancefilm). The challenge, in creating cine-choreography (Brannigan’s term), or dance film is to express the tangibility or physical presence of the body through the virtual, the ephemeral screen. Brannigan suggests that dance-filmmakers use the “transference” between a body and a material object – shirt-sleeve, button, hair, boot-lace – to assist in heightening the kinaesthetic impact of the work for the viewer. It occurred to me that dressing as a Victorian to camera is a simple way of alluding to, or illustrating the property of the photographic device – be it a stills or movie camera – to create the past out of the present. I would, literally, become a past version of myself in both real, and camera spaces. In an early rehearsal I set up the camera and the projector to explore the relationship of live action to projected image. The camera frame happened to catch the corner of the projected image and therefore created a feedback loop, where my live action occurred not once, but twice in the projected image on the wall. There was a slight delay between my live action and the first virtual me, and then a further tiny delay until the action occurred again in the second image (the projection within the projection). This fortuitous accident accentuated both the feeling of time passing, and the connotation that the images of me are occurring now in real time, but are also simultaneously in the past. I resolved to choreograph my actions so that this feedback loop would be revealed some way through the performance. I found that the action of dressing and putting my hair up – something that is usually quite private – is very contemplative and, in addition to the actual fact of my being both in the past and the present in the performance, this slow private activity alludes thematically to contemplation and therefore to memory. Similarly, at some point during the run up to our group show in the Brighton Fringe, it occurred to me that songs are often very nostalgic for me – singing is either a means of directly accessing a memory because I remember singing the song at some time in the past, or the content of the song is nostalgic for the song-writer and conjures nostalgic feelings in me. I decided to try singing something during the performance. I chose a song that I used to sing as a child, and one which directly alludes to the passage of time.